"It was a wonderul morning, with a sky of indescribable blue and big, clean-looking cumulus clouds, and the water was sparkling and alive. You have seen the water with that lively look; you have also seen it dead and uninviting in a way that dampens the enthusiasm the moment you wade out into the current." I have not fished a needhami emergence, but the exquisite nymphs show up often (though never abundantly) in my samples. There are reports of this species producing fishable hatches in Pennsylvania, New York, Connecticut, Michigan, and Wisconsin. Most authors say this hatch begins and peaks in late June and dwindles through most of July. 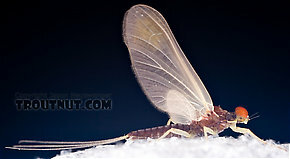 However, in Mayflies: An Angler's Study of Trout Water Ephemeroptera , Knopp & Cormier list a different emergence date than other authors, stating that the hatch can begin in late May. I suspect this refers to the warmer climate of southern Pennsylvania, while others gave dates for the Catskills and Michigan. Knopp & Cormier report that the male and female duns are different colors and vary from stream to stream. Ernest Schwiebert in Nymphs Volume I: The Mayflies: The Major Species reports that they take off from the water quickly after emerging, meaning nymph and emerger patterns might be more appropriate than dun imitations. Substrate: Usually vegetation, occasionally elsewhere. This species has an unusually strong affinity for aquatic vegetation. Many authors have noted this and it is consistent with my samples as well. Ephemerella needhami (Little Dark Hendrickson) Mayfly Nymph View 6 PicturesI photographed three strange striped Ephemerella nymphs from the same trip on the same river: this one, a brown one, and a very very striped one. I have tentatively put them all in Ephemerella needhami for now. Ephemerella needhami (Little Dark Hendrickson) Mayfly Nymph View 5 PicturesI took quite a few notes at the microscope when I collected this specimen. They're attached to the appropriate pictures. Schwiebert, Ernest G. 2007. 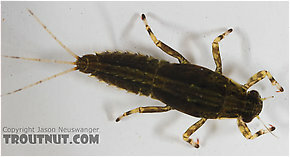 Nymphs Volume I: The Mayflies: The Major Species. The Lyons Press.